Every county outside of New York City has a Jamaica, respectively. These county clerk's offices are typically nearby or directly adjacent to the 'Borough Halls' of these boroughs, with the exception of Queens, whose Borough Hall is the nearby neighborhood of Kew Gardens, though county functions, such as the issuance of marriage licenses, are still performed there. Sixteen counties are governed by a Board of Supervisors, composed of the supervisors of its constituent towns and cities. In most of these counties, each supervisor's vote is weighted in accordance with the town's population in order to abide by the U.S. Supreme Court mandate of "one person, one vote". Other counties have legislative districts of equal population which may cross municipal borders; these counties may also have an elected County Executive. Most counties in New York do not use the term "Board of Supervisors." 34 counties have a County Legislature, six counties have a Board of Legislators, and one county has a Board of Representatives. The five counties, or boroughs, of New York City are governed by a 51-member City Council. 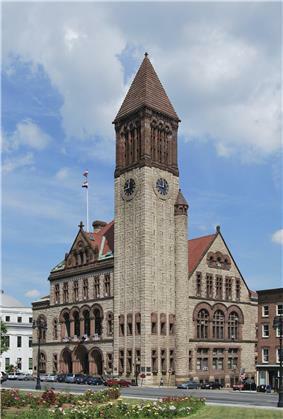 Albany City Hall. Albany is New York's capital city and also its oldest settlement. In New York, each charters, which can differ widely among cities, while most villages are subject to a uniform statewide Village Law (twelve villages still operate under charters issued by the state legislature prior to a revision of the State Constitution in 1874 that forbade chartering villages). Also, villages are part of a town (or towns; some villages cross town borders), with residents who pay taxes to and receive services from the town. Cities are neither part of nor subordinate to towns except for the city of Sherrill, which for some purposes is treated as if it were a village of the town of Vernon. Some cities are completely surrounded by a town, typically of the same name. 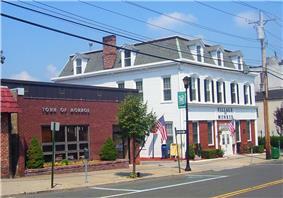 The use of "town" in a community's name is irrespective of municipal status. Elizabethtown, Germantown and Stephentown are towns. Cooperstown, home of the Baseball Hall of Fame, is a village, Jamestown is a city, and Levittown is an unincorporated hamlet. Some hamlets are former villages that have dissolved their incorporation (Herkimer County; Rosendale, in Ulster County; and Andes in Delaware County, for example). In New York, a village is an incorporated area, about 85% of which falls within a single town. 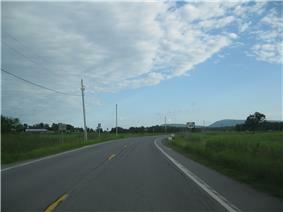 Villages in New York State are classified by the Census Bureau as incorporated places. Like all municipal corporations, villages have clearly defined legal boundaries. A village is a municipality that provides services to the residents, services which may or may not include garbage collection, management of cemeteries, street and highway maintenance, street lighting, and building codes. Some villages provide their own police and other municipal services. Villages have less autonomy than cities. Those services not provided by the village are provided by the town or towns containing the village. As of the 2000 census, 9.9% of the state's population was living in one of the 556 villages in New York. While most villages are subject to a uniform statewide Village Law, twelve villages operate under charters issued by the state legislature prior to 1874. Before a revision to the State Constitution in that year, villages were formed by the state legislature through granting of charters. Many villages reincorporated, dumping their charters in favor of the Village Law. The villages that retain their charters are Alexander; Carthage; Catskill; Cooperstown; Deposit; Fredonia; Ilion; Mohawk; Ossining; Owego; Port Chester; and Waterford. These villages must still comply with those aspects of Village Law that are not inconsistent with their charters. Some places containing "Village" or the suffix "-ville" in their name are not villages. Examples include Greenwich Village, Smithville, and Mechanicville. A borough is only a division of the city of New York, and neither of the state nor of any other city in the state. Each of the five boroughs of the city is coextensive with one of the city's five counties. Under the General Municipal Law of the State of New York, a borough results when the towns, villages and cities in a county merge with the county itself. A distinctive feature of a typical county retained by New York boroughs is the election of a separate district attorney for each borough. Each of the five New York City district attorneys prosecutes crimes in the name of the county rather than the name of the borough (for example, the district attorney for the borough of Brooklyn is called the Kings County District Attorney). School districts are rarely precisely coextensive with the cities, towns, villages, or hamlets that bear the same name, meaning that a person living in one hamlet or village might send their children to a school associated with a different hamlet or village. Residents pay school taxes to the same school district in which they live and any children living with them attend school. All tax-paying residents are eligible for the STAR Program tax rebate which in effect lessens the value of an individual's primary residence to lessen the tax burden on the residence. In 1853, the legislature established union free school districts, which are districts resulting from a "union" of two or more common school districts, "free" from the restrictions that previously barred them from operating high schools. In July 2004, there were 163 school districts of this type. Despite being able to operate high schools, thirty-one of these districts provided only elementary education. Those districts that are not components of central school districts provide secondary education by contracting with other districts. Each union free school district is governed by a three- to nine-member board of education. Owing to the extremely large number (730) of school districts, many of which are quite small, most of them are organized into 37 supervisory districts. Each of these has a Board of Cooperative Educational Services (BOCES). Each BOCES provides services which are considered difficult for the member school districts to provide on their own, often including special classes for students with disabilities. Fire districts are public corporations which generally provide fire protection and other emergency response in towns outside villages. A fire district can levy taxes and incur debt just like other general purpose municipal corporations, although fire districts do not have home rule powers and the taxes are generally collected by the town or towns that the district serves. Fire districts depend on their towns for initial establishment, expansion of district territory, and dissolution, but are otherwise thereafter autonomous political entities able to exercise only those specific powers granted to them by statute. The district is governed by a board of elected commissioners. Public benefit corporations in New York operate like quasi-private corporations, generally with boards appointed by elected officials. They are a form of government bureaucracy in one sense but, unlike government agencies, public benefit corporations are exempt from some regulations. Of particular importance, they can take out their own debt, allowing them to bypass legal limits on state debt. This allows them to make potentially risky capital and infrastructure investments without putting so much of the credit of New York on the line. However, it also allows them to avoid many of the oversight and reporting regulations which apply to state government. ^ Gibson, Ellen M.; Manz, William H. (2004). Gibson's New York Legal Research Guide (3rd ed.). Wm. S. Hein Publishing. pp. 257–258. ^ "Certificate of Individual Indian Exemption from State Taxes on Property or Services Delivered on a Reservation" (PDF). New York State Department of Taxation and Finance. Retrieved 2011-03-21. ^ Governor Eliot Spitzer (2007). "Executive Order No. 11: Establishing the New York State Commission on Local Government Efficiency and Competitiveness." (PDF). State of New York. p. 1. Retrieved 2009-04-03. ^ The New International Webster's Standard Dictionary (2 ed.). United States: Trident Reference Publishing. 2006. p. 84. ^ a b "Census Glossary". American FactFinder. pp. Incorporated place. Archived from the original on 2009-03-22. Retrieved 2009-04-05. ^ "City Charter". City of Sherrill. p. Title I, Section 3, final sentence. Archived from the original on 2009-05-02. Retrieved 2009-04-05. ^ "New York official county websites". Archived from the original on 2009-04-08. Retrieved 2009-04-05. ^ a b c d "New York -- Place and County Subdivision". US Census Bureau. Retrieved 2010-06-08. ^ "Census Glossary". American FactFinder. pp. Town. Archived from the original on 2009-03-03. Retrieved 2009-04-05. ^ "Detailed U.S. Census Bureau map of New York" (PDF). 2000. pp. "p. 4; Note the towns of Champlain (Clinton County), Chateaugay (Franklin County), and Bellmont (Franklin County)". Retrieved 2009-06-13. ^ "Legal Memorandum LG06". New York State Office of General Counsel. Retrieved 2009-05-18. ^ a b c "Census Glossary". American FactFinder. pp. CDP. Archived from the original on 2009-03-28. Retrieved 2009-04-05. ^ "Participant Statistical Area Program: Census Designated Places (CDPs) Census 2000 Criteria". US Census Bureau. Archived from the original on 2009-05-06. Retrieved 2009-04-08. ^ "Map of Lake Luzerne-Hadley CDP". Retrieved 2009-05-23. ^ a b Census Designated Place (CDP) Program for the 2010 Census - Final Criteria, Federal Register, February 13, 2008 (Volume 73, Number 30). Retrieved 2008-12-05. ^ Gibson, Campbell (July 9, 2008). "Population of the 100 Largest Cities and Other Urban Places In The United States: 1790 to 1990". U.S. Census Bureau, Population Division. Archived from the original on 2009-04-14. Retrieved 2009-04-12. ^ "Map of hamlets and villages within the Town of Islip". "Map of North Bay Shore CDP". ^ The Urban Design Project. "The Western New York Southtowns Scenic Byway: Volume 2- Corridor Management Plan; Section VII. The Signage Plan" (PDF). ^ "Guilderland Center Hamlet Plan". Behan Planning and Design. May 12, 2009. Retrieved 2009-10-07. ^ "Proposed Hamlet Zoning Changes" (PDF). Town of Wilton. August 7, 2008. Retrieved 2009-10-07. 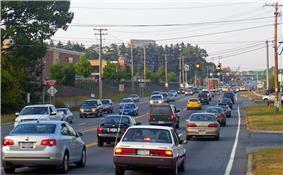 ^ "Town of Williamson Route 21 & 104 Gateway Study: Executive Summary" (PDF). Retrieved 2009-10-07. ^ New York State Gazetteer. Albany, NY: New York State Department of Health. 1995. Available at New York State Library Digital Image Project. ^ "About". Sewanhaka Central High School District. Retrieved 2009-07-14. By the late 1950s, the post war baby boom had changed the single high school into a Central High School District with five buildings, serving students in grades 7 through 12. ^ "BOCES of New York State". Boards of Cooperative Educational Services in New York State. Retrieved 2009-07-30. Welcome to the www.boces.org, the Web site representing all 37 Boards of Cooperative Educational Services (BOCES) in New York State. ^ "Frequently Asked Questions". Firemen's Association of the State of New York. Retrieved 2015-02-26. Local Government Handbook (PDF) (6th ed. ).